The Weemss webpage creator lets you build a page for your event in a matter of minutes. Click on Website > Event webpage on the Event menu. At the top you will see the event page URL link. 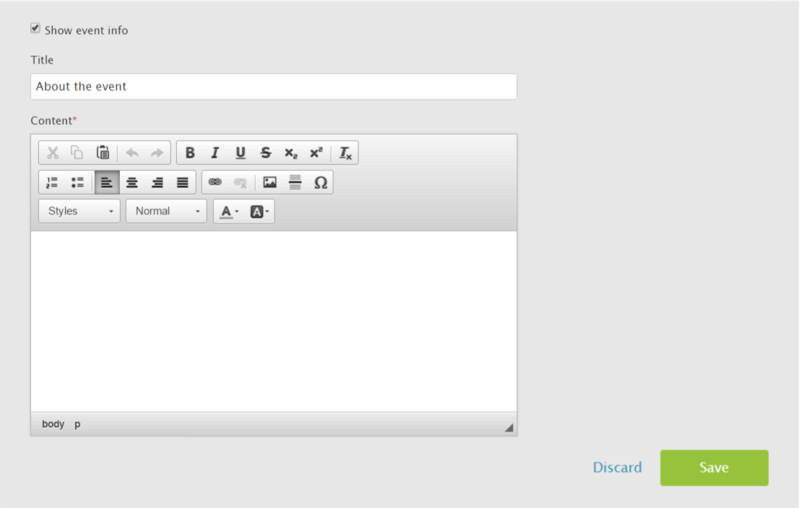 Below it are the different elements you can add and edit until the page looks the way you want. Event name: the name of the event as you want it to appear on your event webpage. Show dates: allows you to select whether to show date and time of the event. The date and time of the event can be changed from Event settings >General. Show register button: again this allows you to select whether to display or not a Call-to-action (CTA) button at the top of your event page. The button takes participants straight to the registration form and is a solid method of triggering more registrations. In the Button text field you can even change the text of the button to your liking! Allows you to upload your own cover image or choose one from our gallery. Recommended image size: 1920x750px. Allowed file types: png, jpg, gif, bmp. Maximum file size: 2MB. This is where you add the actual content for the webpage. You have the usual set of formatting options for a text editor and the ability to add images. Since you cannot host images in Weemss, you will need to upload those images somewhere, like Google Drive, Dropbox, Flickr, ImageShack, or any of the other image hosting services on the web. Once the images are uploaded you can add them using the Image function from the tools bar in About the event. To add an image click on the Image tool and in the URL field on top of the pop-up window, enter the link leading to the image! Every image has to be added separately and you can add as many as you need. This lets you choose the text sits just above your registration form. Remember that the purpose of the registration form is to trigger a response from the potential buyer, so a call to action would work great. 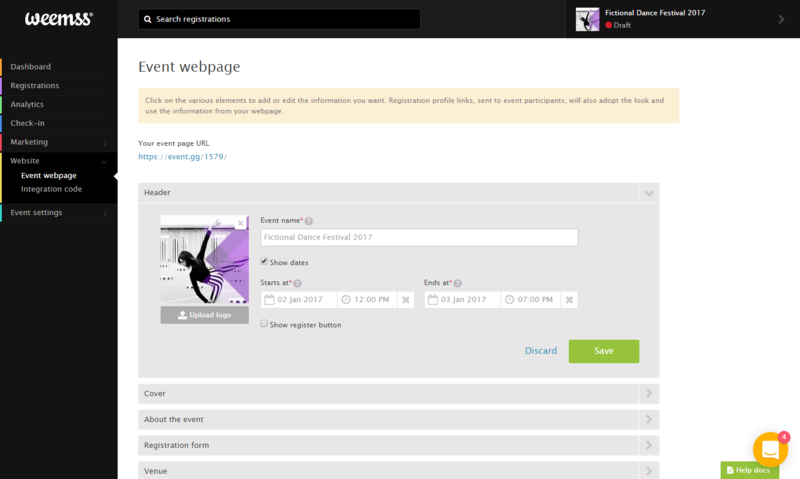 This is where you can add links to your event’s or company’s social media channels, as well as your contact information. Remember to click SAVE after making changes to your webpage. You can see the results of these changes by opening the event page URL. Remember that the Registration profile links, sent to event participants, will also adopt the look and use the information from the webpage!